Portara is situated on a small rocky island on the fringe of the harbor, and it is the monument which makes the most impression on the visitors having become the island’s trademark. Over the centuries the local people have given it the name Portara (i.e. huge door). 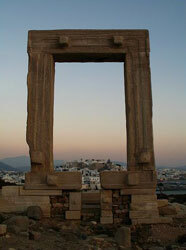 This monument, forgotten by time, is the gigantic marble gateway into what was once a temple dedicated to Apollo. The temple was built in the 6th century BC, during the reign of the tyrant Lygdamis, when Naxos was a prominent naval, commercial and cultural centre. Today this small island on which the temple was built is called Palatia. The Christians built a church over the remains of the ancient temple, as was customary at that period. Around the church an important settlement developed. During the time of the Venetian rule, several marble architectural remains from the temple were used to build the castle.